The Vancouver Condo Buzz » Boutique West Side Vancouver EMPIRE at QE Park Condos for Sale! LEED Gold Certified 1 -3 Bedroom EMPIRE Vancouver Condos & Townhouses Available! « SPECTACULAR Vancouver Kensington Gardens Condos by Westbank Previewing Fall 2013! 3 Uniquely Designed High-Rises, Townhomes, Podium Apartments & Penthouses for sale at Kensington Gardens Vancouver Master Planned Community! REGISTER NOW! EMPIRE at QE Vancouver Condos is the newest West Side luxury real estate development that is making waves in the news. Brought to you by world class and well respected Intergulf Development Group, the new West Side Vancouver EMPIRE at Queen Elizabeth Park project offers stunning views of the park and North Shore mountains in addition to spacious and luxurious 1, 2 and 3 bedroom condos and townhouses. The boutique low-rise building at the luxury Vancouver EMPIRE condos features concrete construction, central air conditioning, beautiful views as well as the most amazing block of Cambie Street. The unique and distinctive building architecture follows the natural curve of the streetscape and is truly beautiful from all angles. It is also very unique to the area, but blends seamlessly into the neighbourhood. As well, there are energy efficient windows, a shared roof top lounge and LEED Gold certified quality homes on the West Side Vancouver luxury real estate market. The boutique EMPIRE at QE Vancouver Westside condos will also feature an enterphone at the lobby entrance and a parkade entrance with access control systems for extra security. There are hard wired smoke detectors and sprinklers in each home and all of the condominiums and Vancouver EMPIRE at QE townhouses will have pre-wiring for both high speed cable and internet with a complimentary TELUS package. There’s secured underground parking. All of the Queen Elizabeth Park Vancouver EMPIRE at QE condos are backed by the comprehensive Travelers Guarantee Company of Canada warranty. For more information, please visit www.empireqe.com today. Also, the Vancouver EMPIRE at QE Park condo presentation centre is now located at City Square Mall (Cambie and 12th Street) with a new display centre available for viewing. Please note that the interior finishes are subject to change at any time! As mentioned above, the ultra boutique EMPIRE at QE PARK condos on Vancouver’s West Side real estate market are unique and high-end. The homes will have expansive 8’-7” ceiling heights in most rooms and homes in addition to sophisticated interiors that are designed by award winning BYU Design. There are two professionally designed colour palettes and finishing palettes for you to choose from that are called Light or Dark. All of the Westside Vancouver EMPIRE condos will come with air conditioning for year round comfort in addition to sleek roller shades for privacy and high performance acoustic underlay to reduce sound transfer between floors. There is durable wool blend carpeting in the bedrooms and engineered hardwood floors in the kitchen, living/dining areas and entrance. All of the boutique Vancouver EMPIRE at QE PARK condos will come with Blomberg washer and dryer (stacked) in a spacious laundry closet. The bathrooms at the QE PARK Empire Vancouver Westside condos and townhomes will have Duravit undermount sink Duravit dual flush toilet (water conserving) and recessed pot lights. The ensuite bathrooms or main baths in 1 bedroom suites will come with a professionally designed vanity that includes a framed mirror, horizontal grain wood veneer cabinet with soft close hardware in addition to a pull-out drawer with wire basket organizers (in select floor plans), stone slab counter with waterfall gable in Marble (light colour scheme) or Travertine (dark colour scheme). In addition, they will also have sophisticated sconce light and custom designed wall cabinet with drawers. The ensuite bathrooms or main baths in 1 bedroom homes at the Westside Vancouver EMPIRE condos will also come with sleek, tailored Grohe chrome sink faucet, frameless shower door, large format white marble tiled floors, polished white porcelain shower surround tile and other luxurious features. The main bathrooms in 2 bedroom or larger homes and Westside Vancouver EMPIRE at QE townhomes will come with a beautiful vanity with elegant framed mirror, stone slab counter, sophisticated sconce light, two convenient pull-out drawers and horizontal grain wood veneer cabinets with soft close hardware. As you can see, all bathrooms are luxuriously finished with high-end features. The kitchens at the EMPIRE Vancouver QE PARK condos will come with quartz conters in Carrara with matching accent backsplash, horizontal grain wood veneer kitchen cabinets and integrated finger pull and soft close hardware for cabinetry. As well, the QE Park Vancouver EMPIRE condos will also come with full height pantries in most floor plans and a high-end appliance set that includes a fully integrated 30” Miele fridge with bottom mount freezer, Miele 30” drop in gas cooktop, Miele 24” built in wall oven (1 bed) or 30” (2 bed) and Miele stainless steel dishwasher. The Westside Vancouver EMPIRE at QE condos will also have a built in Panasonic microwave with stainless steel trim kit and a powerful 30” Venmar hood fan. The kitchens also come with recessed pot lighting, under cabinetry task lights, Italian crystal lighting above the kitchen islands, under sink sliding waste & recycling centre as well as an undermount double bowl sink. West Side Vancouver condos are previewing at the new EMPIRE at Queen Elizabeth Park project by Intergulf Developments. Centrally located just directly across from the West Side Vancouver’s most stunning green spaces, Queen Elizabeth Park, Empire at QE Park is situated on one of the most beautiful blocks on Cambie. From stunning mountain and park views to spectacular high-end interiors, the Vancouver Empire at QE Park condos are not for the common folk. 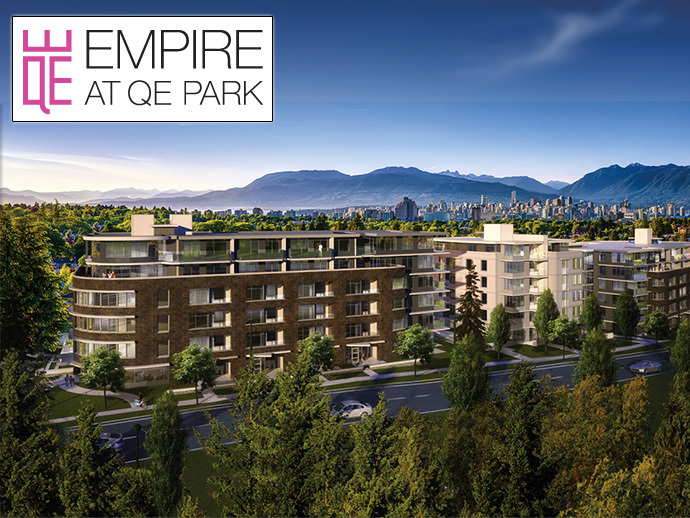 Featuring 1, 2 and 3 bedroom luxury Vancouver West Side condos, Empire at QE Park overlooks the picturesque greenspace. Own West Side prestige and luxury today. A great opportunity to purchase a Westside home with 1, 2 or 3 bedrooms overlooking one of Vancouver’s most beautiful parks, EMPIRE at QE Park Vancouver condos is brought to you by leading developer Intergulf Developments. 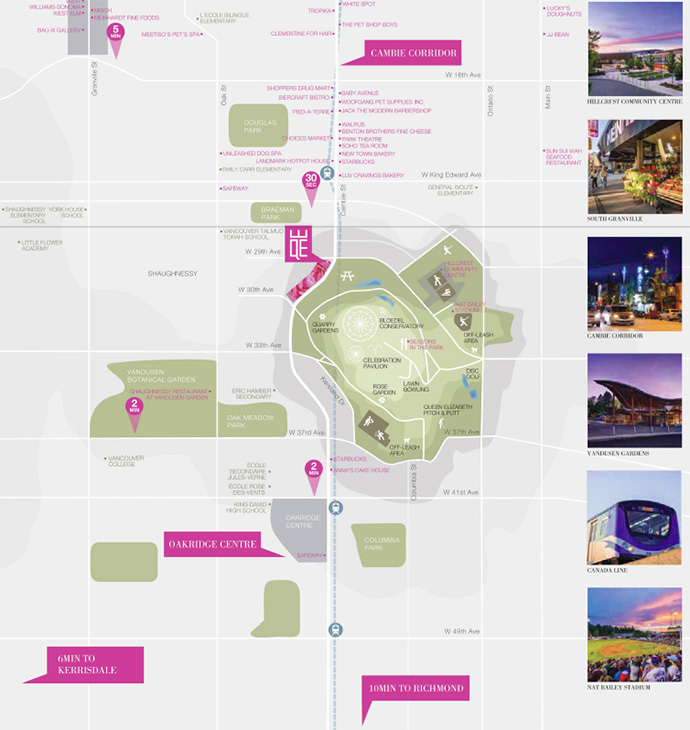 The homes will feature stunning panoramic park views as well as great views of the North Shore mountains and cityscape. The presale Vancouver Empire at QE Park condos will also have luxuriously finished interiors.